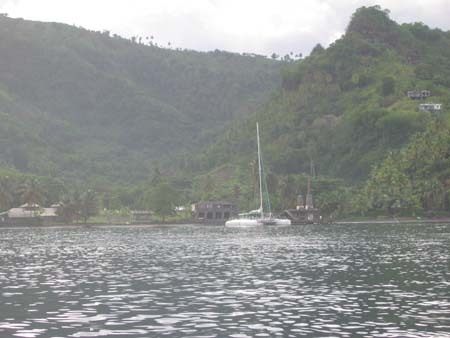 Wallilabou, Chateaubelair and Cumberland are spectacular anchorages on the leeward coast of St. Vincent. Beautiful and rugged they can also be a little sketchy with very aggressive boat vendors and occasional rip offs. We have never been personally troubled but reports abound. 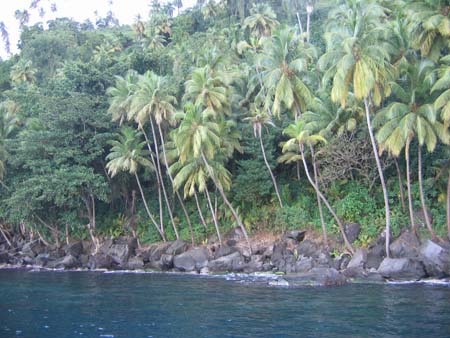 Cumberland has afforded us particularly pleasant stays and a stop along here breaks up a trip to or from Bequia. East of Petite Byahaut and in the Grenadines, the boat vendors protect their livelihood by maintaining some order. Things are a little more disorganized on the "mainland". We enjoyed the land tour of St. Vincent (particularly the botanical gardens). Petite Byahaut is very small and hard to reach town from. People stay there for the restaurant and snorkeling. Young Island Cut is the big boat hangout on the southern coast and is reputed to have a lively scene. We have taken moorings in Young Island Cut and enjoyed it, done land tours and business ashore but we never leave the boat after dark. We chartered out of Blue Lagoon and enjoyed it but for our visits to the mainland, we usually leave the boat at anchor in Bequia and take a ferry across. 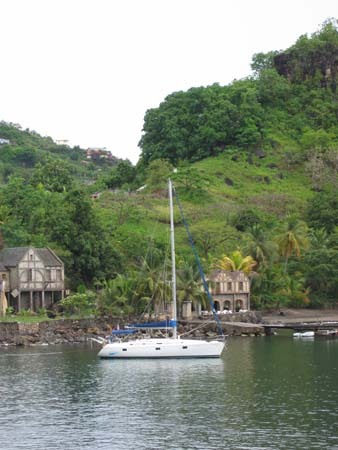 If there is some wind and the seas aren't too bad, sail down the eastern coast from St. Lucia to Bequia as you avoid the long painful period of motoring along the lee coast. The Wallilabou anchorage mostly looks like the movie except they digitally edited out the radio tower on the southern edge. 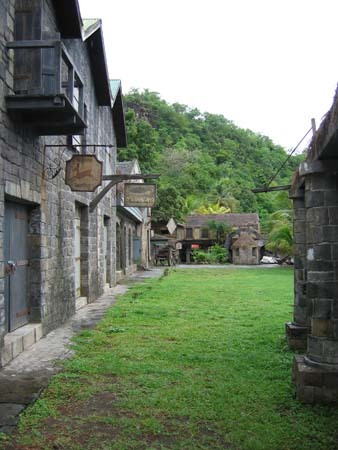 Disney offered to remove all the sets and the window dressing done to some of the permanent buildings but the locals quite rightly decided that the sets would serve as a tourist draw and asked that they be left alone. The last time we were by, Pirates II and III were being filmed and it was closed. Before that, storms had damaged much of the set so it may well look quite different now. We'll let you know. Eaux Vives at Wallilabou, St. Vincent and the Grenadines. Capt. Sparrow is ashore. We will stay in the northern part of St. Vincent while traveling north. 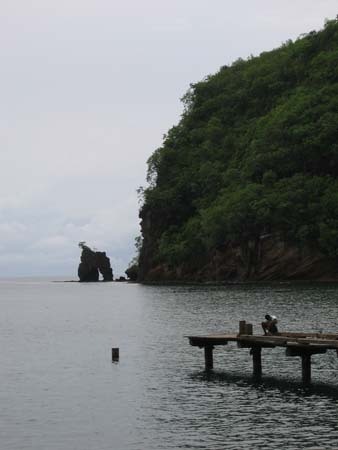 It is possible to check out of SVG at Wallilabou but the customs there is a little uncertain in which hours it is open. Pick one boat boy, tell him he's the one for all the business and to keep the others away. 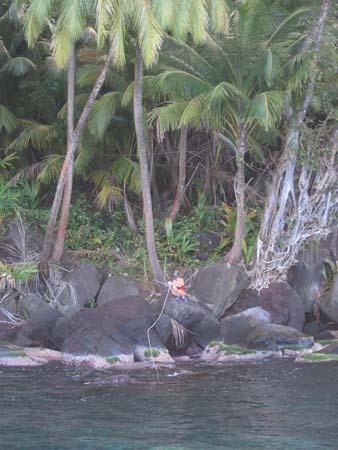 Buy some bananas, pay him to take a stern line ashore. He needs the money and will perform good service for you.